Today is Earth Day. I thought it would be appropriate to let you know that you ( thrifters are ) actually doing more than saving big, but you are part of something bigger. Thrifting is the best form of recycling and reducing stress and excess waste in the environment. I am an Environmental Scientist , so anything I can do to help save the environment is important to me. So next time you head to your local thrift store, you can feel good knowing that you are helping save the earth while you are also saving money. For those who love to shop there may be nothing better then browsing through the mall and snatching up a pair of Manolo Blahniks. Except maybe for getting that pair at a ridiculously low price while saving a little piece of the earth at the same time; that’s shopping gold. 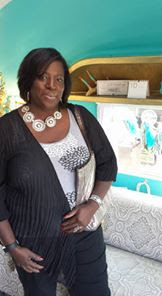 Thrift and consignment shopping became popular in the wake of the recession, and four years later even with some small signs of economic recovery, second-hand shopping remains a trend. According to the Association of Resale Professionals, the number of thrift and consignment stores has increased by 7% for the past two years. About 16% to 18% of Americans shop at thrift stores in any given year, and 12% to 15% shop at consignment shops. To put that in perspective according to America’s Research Group about 19.6% shop at apparel stores and 21.3% at department stores. While shoppers are rushing to thrift and consignment stores in order to save money they are also doing their part to save the environment. ABC News estimates that 98% of the clothing purchased in the U.S. comes from abroad. That means that a sweater hanging on the rack at a department store traveled thousands of miles, using up energy and polluting the planet with coal and natural gas along its way to the store and ultimately an American closet. In contrast buying second-hand clothing produces a significantly smaller carbon footprint. While the sweater may first have came from thousands of miles away, it likely made itself into the shop after someone in the community wore it and then sold or donated it to the shop. The only carbon emissions associated with that sweater is the fuel it took the donator and the shopper to drive to the store (even less if that person walked, biked or took public transportation to said store). The whole someone-else-wore-it-first thing can turn some people off to vintage shopping, but buying and using gently worn clothing follows one of the principals of the environmental friendliness: reuse. It also keeps those items out of landfills. Packaging associated with brand new items often ends up in landfills as well. Anyone who has ever bought something new knows those products come with a lot of packaging be it plastic, tissue, tags, etc. Gently worn items purchased in a consignment or thrift shop eliminate that unnecessary packaging. Second-hand clothing is a good alternative to organic clothing for those on a budget. New clothes are often made with fabrics that can be harsh on the skin like polyester and other synthetic fabrics. Buying second-hand makes it easier to avoid these fabrics. 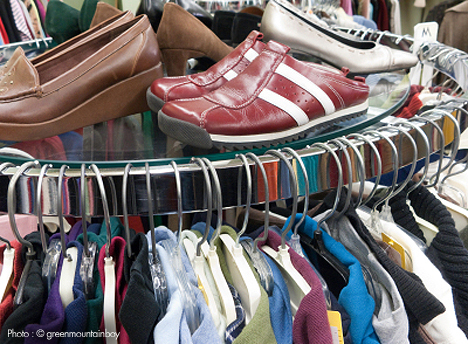 Consignment and thrift shopping reduces the carbon footprint while reusing items and saving shoppers money. This article is reprinted with permission from www.hellawella.com.